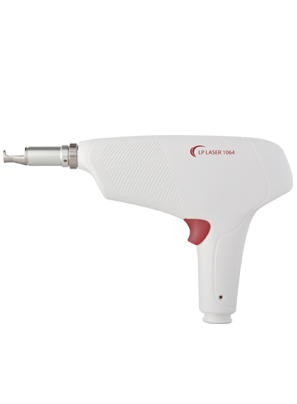 The LP Nd:YAG 1064 laser handpiece is used for a range of applications – from deep vascular lesions such as varicose veins to more superficial lesions such as broken capillaries. The handpiece is equipped with two spot sizes- 3 cm2 and 6 cm2, and its fluency range is 30-350 J/cm2 . The pulse structure is available in two modes- smooth and long. The pulse duration of the smooth pulse is 10-30 msec and 4-10 msec for the long pulse (and in the long pulse you can also define the intervals between the pulses). The ergonomically designed handpiece is easy to operate and allows fast access to all body areas.